David Stouck finds much to his liking in Son of a Trickster. Eden Robinson's third novel, Son of a Trickster, is the start of a new trilogy. Robin Rowland photo. 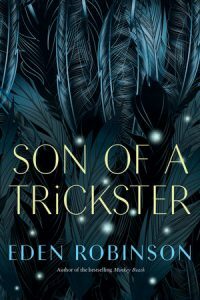 From brutal realism to magic realism, Eden Robinson poses a connection between drugs and mythology. Toronto: Penguin Random House Canada, 2017. In 1997 a book of remarkable short stories by a young Haisla/Heiltsuk woman came across my desk. It had been selected as Editor’s Choice and Notable Book of the Year by the New York Times. 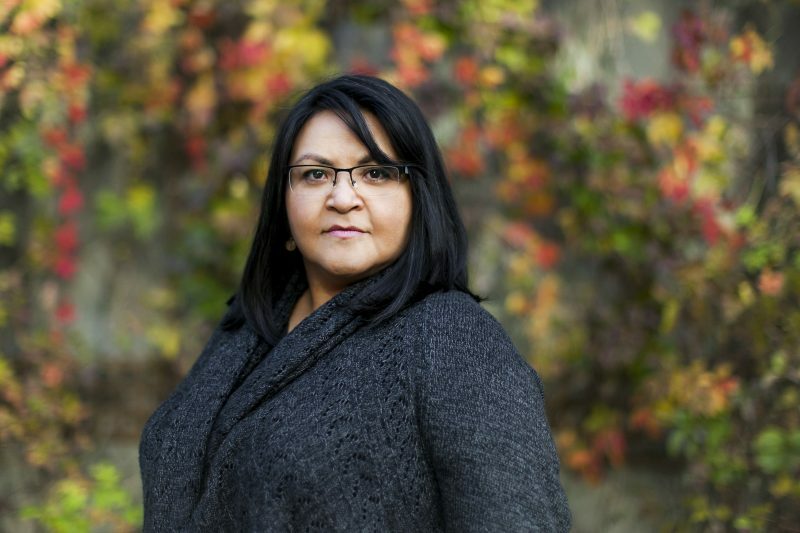 That book was Traplines (1996) and its author was Eden Robinson from Kitimat, BC. Of the four stories in that collection, “Queen of the North” struck me as one of the best Canadian short stories ever written. Its theme was dark—violence to children that was rooted in the residential school system—but the author’s touch was light, or “deft” as critics have frequently phrased it. For the next twenty years Robinson has published novels that have explored related themes, insisting in deft fashion that horror can be allied to humour. There is an interesting trajectory in her novels as regards her reader I would suggest that the audience for her first novel, Monkey Beach, with its reference to sasquatch stories, is the tourist, someone like myself from Ontario when first visiting indigenous relatives on northern Vancouver Island. The first-person narrator in Monkey Beach is searching for her brother lost on a fishing boat, but waiting for word and travelling the coastline becomes an occasion for introducing the reader to a unique traditional culture with its different language dialects, its myths that explain the landscape and its creatures, and its unique food practices—making “grease” to flavor food by rotting oolichans, whipping soapberries with water to create frothy “ice cream.” The reader is given a tour guide of coastal British Columbia and the novel was nominated for two national literary awards. Her second novel, Blood Sports, further accommodates the general reader by writing about the familiar plight of non-indigenous subjects in Vancouver’s Downtown Eastside. 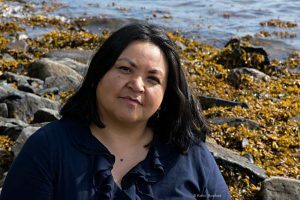 But in her new novel, Son of a Trickster (announced as the first in a trilogy) the reader is no longer a tourist or outsider, but is brought to identify closely with the experiences of a 16-year-old indigenous boy named Jared. Like many of his non-indigenous peers he has some major alcohol and drug issues–he is highly valued by his friends for the marijuana cookies he bakes. But he especially engages the reader because he is a caregiver for his family—his frequently violent mother, his deadbeat father, and for his close ties to his grandmothers—the first chapter is titled “Nanas I Have Loved.” He is also caregiver to elderly neighbours and their granddaughter, Sarah, who eventually shares his bed. Jared’s is a coming of age story familiar to all cultures—but what is different, as the dust jacket suggests, is that his coming of age crashes up against indigenous beliefs and their unique view of the natural world. The novel poses a connection between the use of drugs and myths. Key to that link is the brief second chapter that posits time not as a progression of sequential events, but states that all time is simultaneous. Accordingly the totemic figures of indigenous carvings and storytelling are not just historical; they transform into contemporary humans and vice versa. Jared, not yet attuned to this knowledge, is harassed on a bus to Terrace by a man who claims to be his biological father and says his name is Wee’git (Trickster). Jared moves to the back of the bus (“Christmas always brought out the crazies”) and is glad to see the man get off at the next stop. But when he looks out the bus window to see if the man is really gone, he sees a raven flap upwards in his place. Eden Robinson. Red Words Studio, 2016. Such transformations become a pattern and source of knowledge in the book, what critic and novelist Robert Wiersema calls its magic realism. One afternoon when he is hitchhiking home after a weekend of partying, “an old Native woman” in a burgundy Cadillac stops to give him a ride. She was “perfectly respectable in a flowered dress, work jacket and square orthotic shoes,” but he saw something in her that was “dark as cedar bark, with yellowed fangs and knobby, twisted knuckles.” In spite of her solicitous concern, he shuts the door, backs away and watches “the thing underneath the Grandma-skin start to snarl.” He blames it on magic mushrooms. She tells him a quest story about a shaman’s two sons: the oldest wanted to succeed his father, but in his fasting and self flagellation with spikes of devil’s club, he dies. The other brother rejects his father’s life, but spirits flock to him like mosquitoes and torture him until he submits and becomes a powerful shaman. The old lady believes Jared is like the second brother. But Jared insists he has not believed in such magic since the time he stopped believing in Santa Claus. She insists he will and that she can be his guide. Coming-of-age narratives embody a search for identity and Robinson ends her story with a shuffling of relationships—Who is the real father? Who is the real Nana? Monsters are also very ordinary, contemporary folks, and an important spiritual figure is also a common enough pinch penny and Bible-thumper. At the close Jared is being taken to an AA meeting. The span of this novel from brutal realism to magic realism embodies for me much of what it meant to make contact with the BC members of my extended family. But more importantly what this novel does for the non-indigenous reader is to make totem poles, masks, and legends come alive. This remarkable novel accordingly takes indigenous writing to a new level. Now Bill Reid’s first men emerging from Raven’s clamshell is in motion. David Stouck is an editor and biographer. 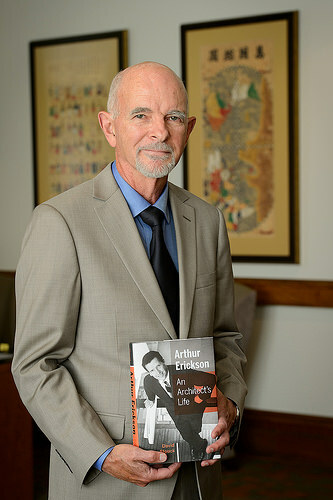 His latest book is Arthur Erickson: An Architect’s Life (Douglas & McIntyre, 2013).